Our product range includes a wide range of commercial kitchen equipment. Packing Type Wooden Box Packing. We are sellers and distributors of Industrial kitchen setup, Commercial Kitchen Equipment, Industrial refrigeration, Commercial refrigeration and concession equipment like warmers, fryers, pop-corn maker, ice maker, Reach-in, under counters, blast chiller, bottle cooler, popper display freezer and electric grills. We have been a preferred vendor to large number " Commecial kitchen Equipment " of Hotels, Stadiums, Restaurants and Multiplex cinemas around India. We also provide Commercial kitchen equipment such as coffee machine. Our focus is not only to provide the product but also after sales services and installation of kitchen appliances according to your specific needs. This has earned us a reputation of being master in Commercial Kitchen Equipment installers around Delhi NCR, with 85% customer satisfaction rating. We came up with the idea to serve people, and not just to sell product as one of the Commercial Kitchen Equipment company in India. We keep in regular touch with our client not only to apprise the progress of production but also to set realistic goals for closing the service calls or dealing with issues to minimize stress. Choose from a range of on going services that take care of maintenance, repairs and deep-cleaning. If things go wrong, our specialist engineers will get you back on your feet, fast. After all, we always strive to be the solution to all your Commercial Kitchen Equipment needs. "FOOD" As a Indian We love food. It's the food that creates our connect with the industry that encompassed commercial kitchen equipment for hotels, restaurants, hospitals, food courts, educational institutions, industrial canteens, take away joints, bar, lounges, cafes and other food service or food serving outlets. It was all initiated in the month of December 2015 by Anil Seth, having lived and breathed the service sector for over 25 years. There are lots chefs to cook good food. However, there was a need for served and quality based kitchen equipment service that would help fill the existing gap between the users and commercial kitchen equipment. 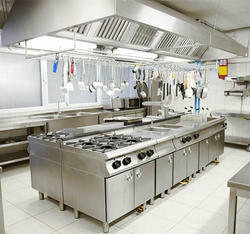 Now, our clients get a well rounded, commercial kitchen equipment experienced.